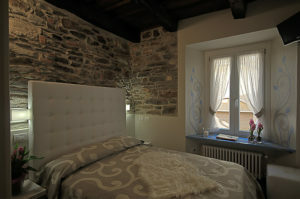 This medium-sized room on the first floor reached by a lift, overlooks the romantic courtyard of the Locanda di Orta. The partially stone walls and the wooden ceiling alternate with colorful paintings and decorations that give a decisive touch of cheerfulness and modernity to the typical appearance of the ancient room. Equipped with a French bed, an open wardrobe, a bathroom with a double hydromassage shower, satellite and digital TV, the room is completed with a ceramic floor, cool in the summer months and practical for allergy sufferers .. The wi-fi is available free of charge in the entire structure, starting from all the common areas, to understand the courtyard and the living room on the terrace, however the historical character of the buildings with very thick walls motivates the fact that sometimes the connection room is interrupted. . Free wired internet is available from the rooms. 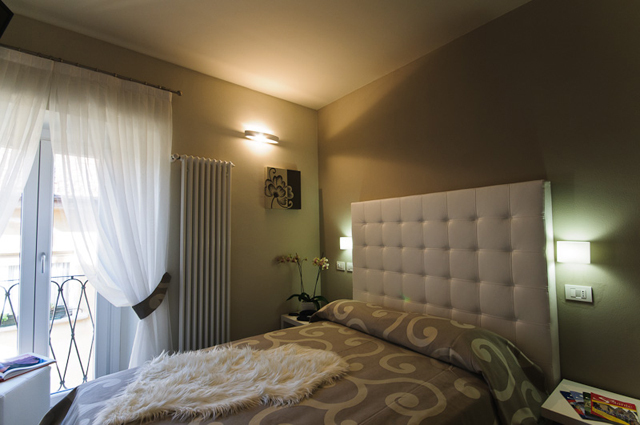 This medium-sized room on the second floor reached by elevator, winks at the romantic courtyard of the Locanda di Orta from the window with clean white curtains. The stone walls and the wooden ceiling bring out the deliberately understated and contemporary style, while small touches of color give a smiling look to the furniture. Equipped with a French bed and an open wardrobe, the bathroom is larger, comfortably hosting a double hydromassage shower. The room is complete with satellite and digital TV, a few modern paintings and a ceramic floor, a distinct advantage for allergy sufferers. The wi-fi is available free of charge in the entire structure, starting from all the common areas, to understand the courtyard and the living room on the terrace, however the historical character of the buildings with very thick walls motivates the fact that sometimes the connection room is interrupted. . Free wired internet is available from the rooms. This small room is on the third floor reached by elevator, overlooking the beautiful courtyard of the romantic Locanda di Orta enjoys a partial view of the lake from the large window. The walls contain colorful paintings and decorations that give a decisive touch of cheerfulness to the modernity of the modern and practical bathroom with shower. Equipped with a French bed, an open wardrobe, SAT and digital TV, the room is completed with a ceramic floor, cool in the summer months and practical for allergy sufferers. The wi-fi is available free of charge in the whole structure, starting from all the common areas, to understand the courtyard and the living room in the terrace, however the historical character of the building with very thick walls motivates the fact that sometimes the connection room is interrupted. . Free wired internet is available from the rooms. 6) For breakfast served in the room, we will apply a supplement of € 5.00. 7) Small dogs are welcome at Locanda di Orta, free of charge.